Check it out! 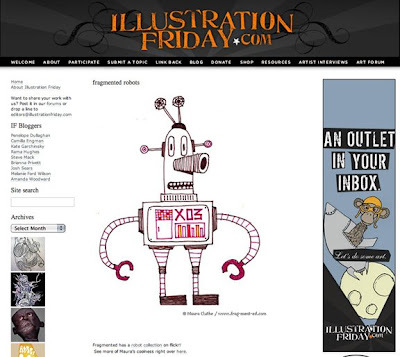 The kind folks at Illustration Friday featured one of my robot sketches today! So cool! Thanks a bunch! And, if you have a bit of time, be sure to check out the great ROBOSHOW over on Drawger hosted by artist/illustrator Carl Wiens. There's a whole bunch of wonderful robot art in the show, including a few pieces by me. I'm not sure how long the show will be up for, but Carl is accepting submissions. "Their prime directive is to serve humankind.... or so they tell us! Let's see your interpretations - good, benign and evil. Contraptions, automatons, gadgets, apparati & visual creations of all shapes and sizes are welcome." There are so many great pieces, but this one is definitely a fave! 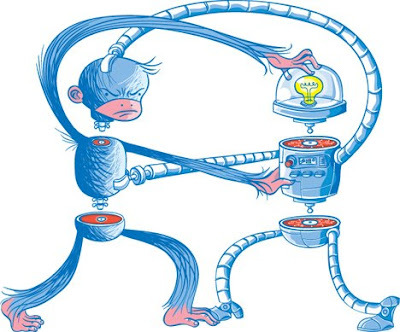 Monkey vs Robot! Ha ha!